Core technologies to help you harness the wind... onshore and offshore. 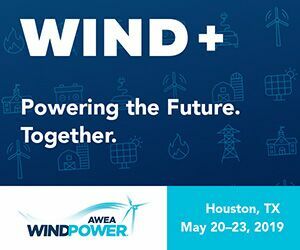 Visit Parker Booth #1245 at AWEA Windpower, May 20-23 in Houston. From filtration and condition monitoring to custom hydraulic power units and advanced accumulators and cooling solutions, Parker has the precision-engineered products and turnkey systems to help the most sophisticated wind power plants generate energy more efficiently, while improving reliability and uptime. Visit Parker, Booth #1245, at the show and download our Wind Turbine Solutions to get a look at our technology. Parker custom Hydraulic Power Units (HPUs) are uniquely engineered for wind yaw and brake applications, for wind turbines of any size. Parker designed the sample shown for a 2.0 MW turbine. Parker experts can assist with fabricating, equipment design, prototyping, system modeling and the integration of electronic and hydraulic systems. Learn more about your custom HPU solution. 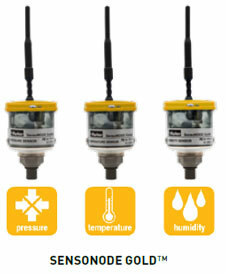 Parker SensoNODE Gold™ is a series of networked wireless sensors developed for continuous condition monitoring for use with cloud or local applications. Combined with Parker's SCOUT software, SCOUT Mobile and SCOUT Cloud, users can quickly access vital information, alerts and analytics to help keep systems operating efficiently. Learn more. Parker developed a special rilsan coating on its new bladder accumulator shell, resulting in a dramatically extended product life when used in the hub or nacelle. The special coating ensures 100% coverage and drastically reduces the friction between bladder and shell surface. It provides excellent corrosion protection and minimizes any future contamination of the system hydraulic oil, and is very cost-effective. 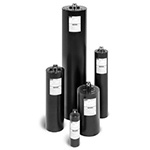 Parker piston accumulators offer several unique advantages including customization and high durability with extremely low gas permeation rates. They are USA-made, with additional manufacturing in Europe, for best-in-class lead times. Crimped to 6" (150mm) bore, available up to 22" (559mm) bore threaded and up to 20,000 psi (1379 bar), these high-speed pistons perform in temperatures from -45°F to +320°F (-42°C to +160°C). Visit us at Booth #1245 at AWEA to learn more about our solutions and use the form below to contact us for more information. 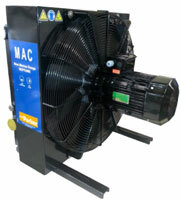 The MAC series is engineered for Marine nearshore and offshore applications and provides cooling capacity up to 300 kW. The corrosion resistance of these accumulators meets C4-M and C5M-M requirements in accordance with ISO 12944. Parker designed its advanced direct operated proportional control valves specifically for high-response, closed-loop controls. An ideal solution to prevent occlusion of the ventilation system and to eliminate costly turbine downtime for servicing bearing grease. The KleenVent eliminates water evaporation in the coolant solution, stops the ingress of airborne contaminants by closing the cooling loop. The KV-CEI removes the need for continuous coolant monitoring during the warm season. Results are greater uptime and reduced overall maintenance, yielding a return on investment in a single calendar year. Read this if your wind turbines are overheating. 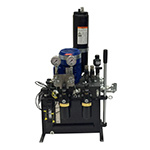 Capable of handling onsite pre-filtration, polishing and transfer of either hydraulic or gear fluid, Parker's "portable" AFS filtration system features a compact (30"x16"x12"), light-weight design. It is ideal for the limited interior nacelle space of wind turbines. Weighing only 85 lbs, this durable system can be transported by two men or lifted via a convenient eye hoist. It also includes an integrated particle count detector.